A new publication describing the first record of Atlantic humpback dolphins in Benin (Gulf of Guinea) has just been published. The publication is available to download from: Marine Biodiversity Records. Zwart, S.J. and Weir, C.R. (2014). Filling in the gaps: first record of Sousa teuszii in Benin (Gulf of Guinea: Africa). Marine Biodiversity Records, 7, e59. DOI: 10.1017/S1755267214000578. 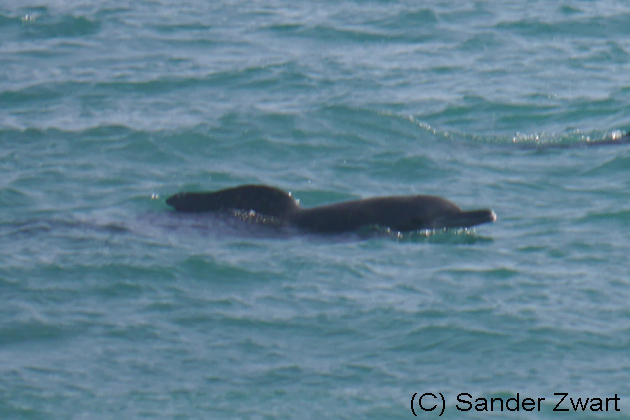 A sighting of four Atlantic humpback dolphins (Sousa teuszii) was recorded and photographed close to the Benin coast on 3 November 2013. This is the first record of the species for Benin, and also represents the first verified record within a 3,065 km stretch of coast extending from Sierra Leone to Nigeria (encompassing the entire northern coast of the Gulf of Guinea). The sighting supports the possibility that some other potential range states may have remained unconfirmed to date due to a paucity of field research in suitable nearshore habitat rather than an absence of the species.